This shows my experience and skills with communication, and engineering beyond software. It shows my ability to apply my technical skills to tangible projects. This includes research, design, testing, refinement, public demonstration, and documenting. My first hurling project of significance was my middle school science fair project (which won prizes in the Seattle Public Schools Science fair back in 2003). 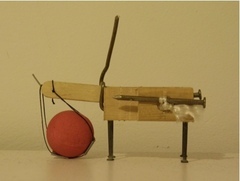 It produced unexpected results about the performance of two types of trebuchets, Fixed Counterweight and Hinged Counterweight. With further use of simulators, I eventually worked out why my finding conflicted with my research (my discoveries are documented on the two pages previously linked). Eventually I became a member of the hurling community at TheHurl Message Board, and learned about many new and interesting designs. Eventually I came up with a design of my own highly efficient, the Floating Axle King Arthur (FAKA). I published my findings to my website, and continued to discuss the design with others. From this design, after much simulation, I built GBB which threw a golfball 320 feet with a 5 pound counterweight, and 690 feet with 15 pound one. Later many other people used my design on a much larger scale (Including J-buchet built and was built, sponsored and designed by Janicki Industries featured in the video below), and it is considered one of the most efficient options available. Work for RLT Industries, Inc.
Due to my writings online, I was offered a job with RLT Industries, Inc., though being a minor and still in highschool, I contracted to write manuals rather than moving to Texas. Apparently my casual discussions were evidence enough that I was worth hiring. This gained me valuable early work experience, as well as tuned my technical communication skills. I also did photography and page layout for the manuals, which discussed constructions, possible experiments, as well as explanations of the physics involved. Much later I wrote similar, but much shorter and less polished example of such a manual for one of my own projects which I own the rights to, and can provide as an example: Making and operating a model onager. Eventually I decided there was no good place for persistent storage and updating of hurling related information. To compliment the discussion at TheHurl Message Board I created The Hurl Wiki. Currently it is almost entirely filled with my own writing, photos and videos, though there are a few pages and edits from other enthusiasts. It was my first major website project, and involved a lot of carful origination and classification of information. The site's structure can be viewed here. In 2010 it got over 43,600 visits, and it has over 248,000 page views total. This is clear evidence that I was able to communicate technical information in a matter than many people found worth using and sharing. 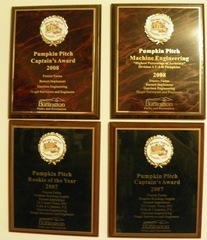 In 2007 and 2008, I entered the Burlington Pumpkin pitch. Unfortunately I was the only youth entrant both years. In 2007 I entered Pumpkin on a Stick. I won Caption's choice award, chosen by the captions of all other constants, as well as rookie of the year. In 2008 I also won the Caption's award, as well as the Machine Engineering award for with the greatest accuracy in the contest. This shows my ability to design, build and operate equipment with a strict deadline and large audience.